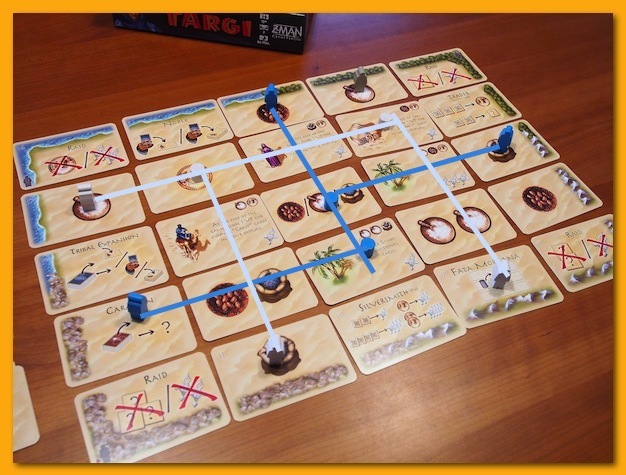 I picked up a copy of Targi at a recent holiday Math Trade on BGG and sat down this weekend to see how it plays. Lisa and I play games for 2-5 players regularly and enjoy them but I’m always on the lookout for a good two-player game. Some times games designed for larger numbers don’t scale down well for only two so it’s refreshing to find something good for two that’s deeper than something like Morels, Lost Cities, Drive, or Dragonheart. 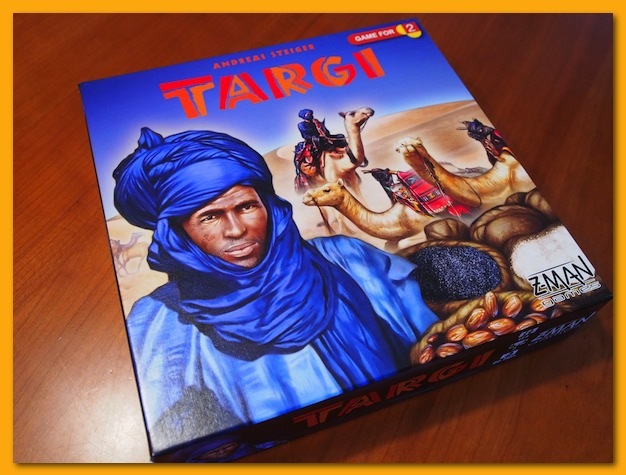 Targi is a “set” collection card game that begins with a fixed set of cards arranged numerically in a rectangle with the “1” card just to the right of the upper left corner and proceeding clockwise around the grid up to “16” in the upper left. The center of the rectangle is filled with nine cards composed initially with five Goods and four Tribe cards alternating between each type of card. 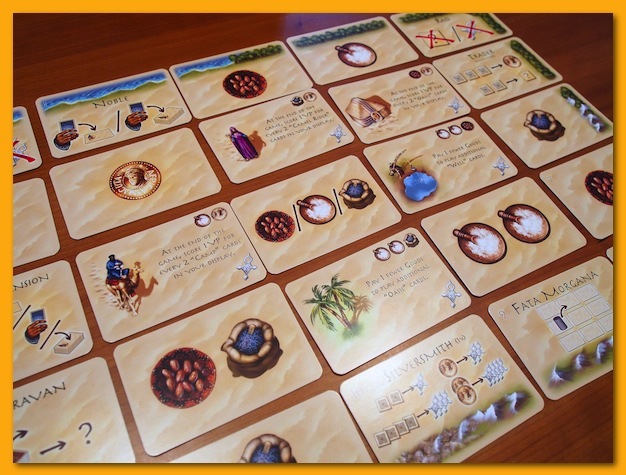 Tribe cards are collected by players after paying the cost and arranged in front of the player to earn victory points at game end as well as to earn the potential special abilities and benefits stated in the center of the card. Players collect goods and coins over the course of the game and spend them to purchase the Tribe cards. The game lasts, at most, 16 rounds or until a player buys 12 Tribe cards. A robber token (a gray meeple) is placed on the “1” card at the beginning of the game and proceeds through card “16”, one card per round, at which point the game ends. Within each round, players alternate placing one of their three meeples on an unoccupied border card. It’s not allowed to place your meeple on the same card as the robber or directly across the grid from one of your opponent’s meeples. Once the meeples are placed, the intersection points of your three meeples represent two other locations within the grid of nine cards that you activate on your turn. Players take the actions the the five locations afforded them in whatever order they choose replacing the internal cards with the opposite type of card. For example, if a Goods card is activated, it is replaced with a Tribe card and vice versa. The actions of the border cards remain consistent from game to game and the cards are never replaced. Some of the border cards grant goods when activated and others grant other special actions that allow trading for various items, adjusting a token on the internal nine cards, free goods from the draw pile of goods, etc. 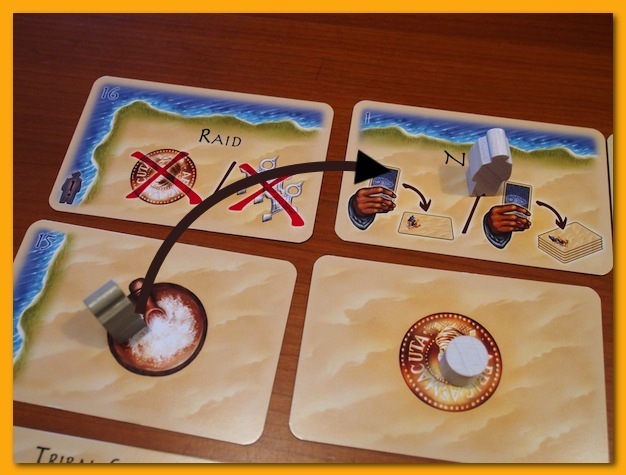 When the robber reaches the corners of the borders a “Raid” occurs and players must give up an ever increasingly painful “something”. 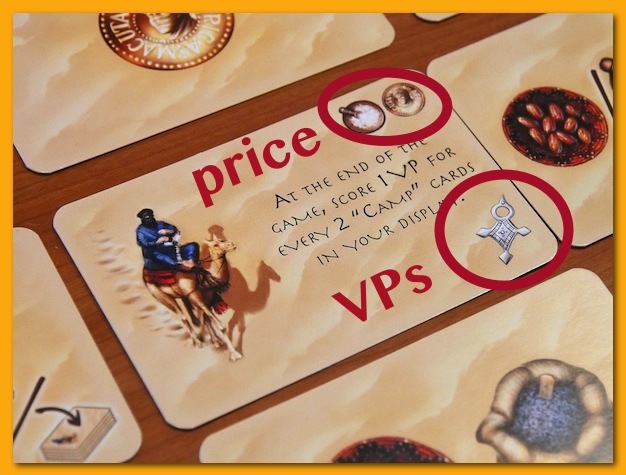 For example, in the last round of the game players must give up a coin or three victory points. Once the Raid is complete, the robber moves ahead to the next numerically higher card and play continues. After the 4th Raid, the game ends. 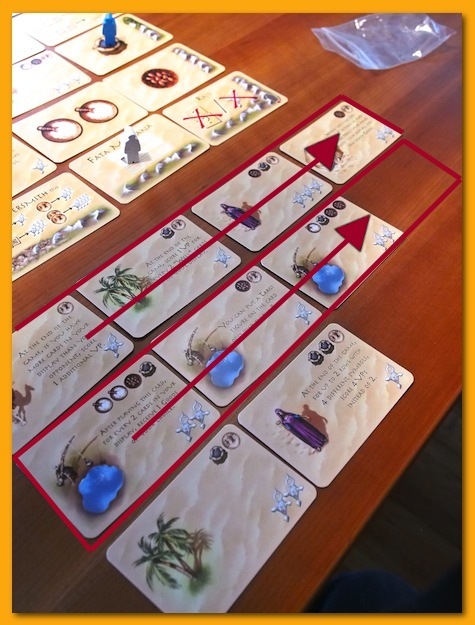 Players collect Tribe cards by paying the price in the upper right hand corner of the card and then must immediately place the card in a 4×3 grid working from from left to right. Players can start new rows before completing the row of four cards but rearranging is not allowed. The Tribe cards are worth the victory points printed on the card but in addition, if the row contains all of the same type of Tribe card, the row is worth an extra 4 victory points. If the row contains 4 different types of Tribe cards, it’s worth an extra 2 victory points. Players are allowed to hold a single card in hand without playing it immediately to their tableau and it takes a special border card action to get it out of your hand. I’ve not had a chance to play the game very many times but I certainly like what I’ve experienced so far. I wonder if the static border will get a bit samey over time. I don’t see that there are too many strategies in the game beyond going for the high VP cards as rearranging your tableau is rare (special cards) and positioning special cards for extra points is difficult. However, the game seems well designed and I’m looking forward to many plays.